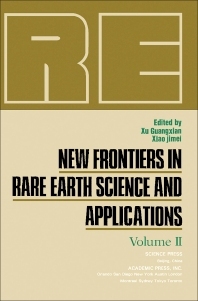 New Frontiers in Rare Earth Science and Applications, Volume II documents the proceedings of the International Conference on Rare Earth Development and Applications held in Beijing on September 10-14, 1985. This compilation discusses quenching and sensitization of rare earth luminescence, magnetic properties of rare earth intermetallics, and microcapsulated rare earth-nickel hydride-forming materials. The effect of rare earth on the quality and properties of hot-rolled steel strips and role of yttrium in heavy section spheroidal graphite cast iron are also elaborated. This book likewise covers the application of scandium oxide in an electron emission material and study on the effect of rare earth elements on the yield of wheat. This publication is beneficial to researchers and scientists conducting work in the field of earth science.